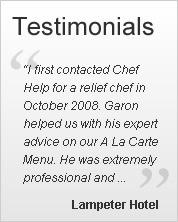 Here at Chefhelp we thrive on pairing our great clients with great temporary chef solutions. If you are a motivated, well organised, dedicated individual that believes you have what it takes to be a Chefhelp recruit, please upload your CV below. Please be sure to add two references as these will be checked, any CVs without references may not be processed.